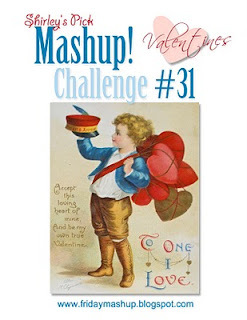 This week over at the Friday Mashup blog Shirley is hosting the challenge and she chose a Valentine theme. Yesterday was Valentines Day and honestly, in my house its just another day. We have always believed in showing love and kindness towards each other every day and if my husband and I feel the need to surprise each other with special things we just do it :) Plus our wedding anniversary is Feb.5th so there is plenty of love to go around! Hubby did bring home chocolate for me and the 3 kids so that was a nice little treat and we were all happy, and thats what matters! 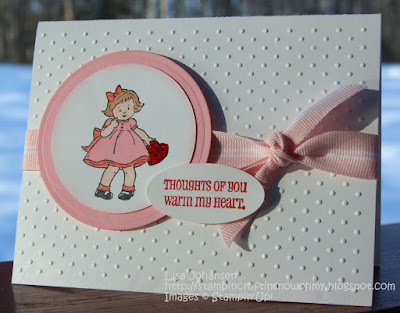 I decided to go with a very simple, girly card. I like simple, but girly isnt always my thing, so its a bit out of the box for me. I think the card came together nicely though. I ran the card base of Whisper White through the Cuttlebug with the Swiss Dots folder and for a little sparkle I covered the heart with Xmas Red Stickles. Love the card, you picked my favorite stamp set of the year. I had a really great Anniversary. I collect Fiesta Ware Dishes and my Husband bought me 2 sets of colors I did not have. He also made dinner, it was one of my favorites, chicken fried steak... YUM. Thank you for the nice comment on the Mashup Blog.. I like the dots....I really wish I bought the Big Shot!!! POO on me. Wait, Wait.... Is that Pink I see on a Lisa card? OMG!!!! Ahh just kiddin' Put I do know that is out of your element..lol I love this so soft and pretty! Perfect Valentine.. Thanks for joining in with the Mashup! Keep them coming!